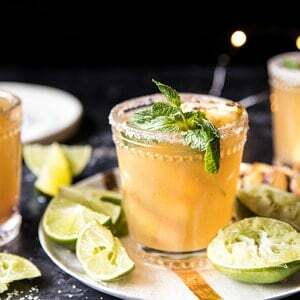 Starting this last Friday of 2017 off right, with these Pineapple Margarita Sparklers. Hard to believe this is the very last Friday of the year. Even though I’m sad to see 2017 go, I’m excited for all that 2018 has in store. Like a lot of you, I too have New Year’s goals, and this year my list is a mile long. I cannot wait to really start tackling it…starting with the return of Healthy January! So many new ideas for Half Baked Harvest, and so many fun projects in store. I’m both excited and nervous, but I can’t wait to get going. Is that totally nerdy? Probably, but whatever, I’m pretty happy to know what I want and to have a pretty clear vision in my head. Is anyone else working on some New Year’s goals? I always love hearing your feedback, comments, and suggestions, so if there’s anything you’d like to see more of in 2018, or if there’s anything that needs improving/fixing, please, please let me know. I want to make HBH the best it can be, so your suggestions are highly appreciated! I’ve spent these past few days with my family, soaking up a little time off. I’ve also been making plenty of new drinks for the crew. 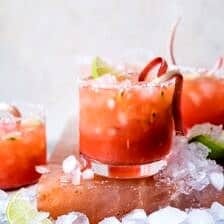 Not going to lie, their favorites are pomegranate mules and mojitos, but when I made this margarita the other day, not a single person turned it down. And yes, they were gone within minutes. Therefore, I think it’s safe to say the family loved these pineapple margaritas. 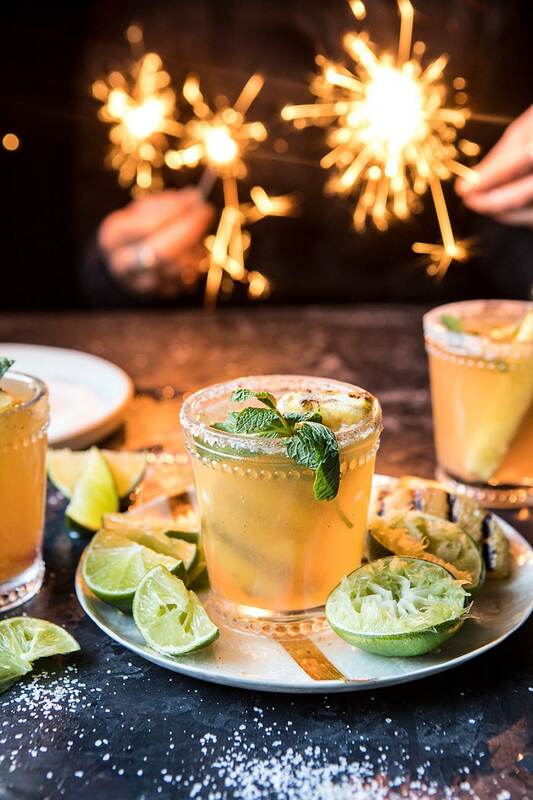 With New Year’s Eve just a couple of days away, I wanted to share these fun sparkling margaritas with you all. Normally, I would have posted this drink on Saturday (I almost did, but I have another post in store for tomorrow), but I wanted to be sure to give you all proper time to plan. 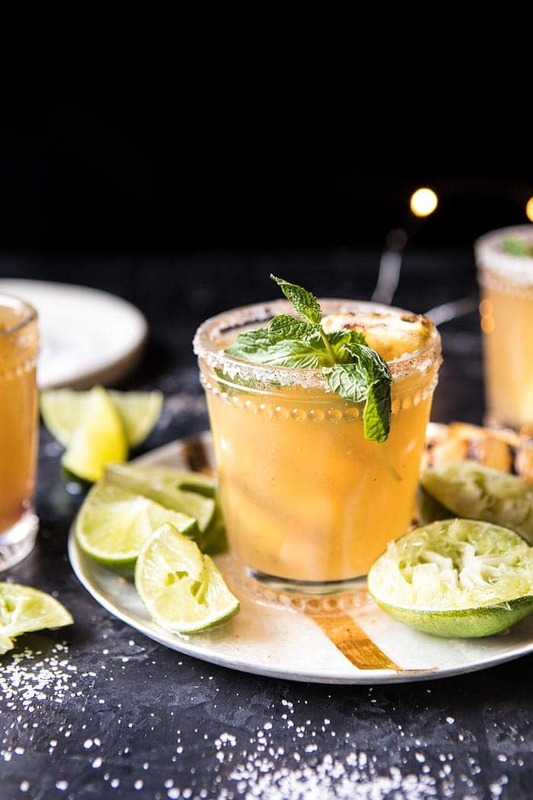 Because let’s be honest, all New Year’s Eve parties need a great margarita, right?! 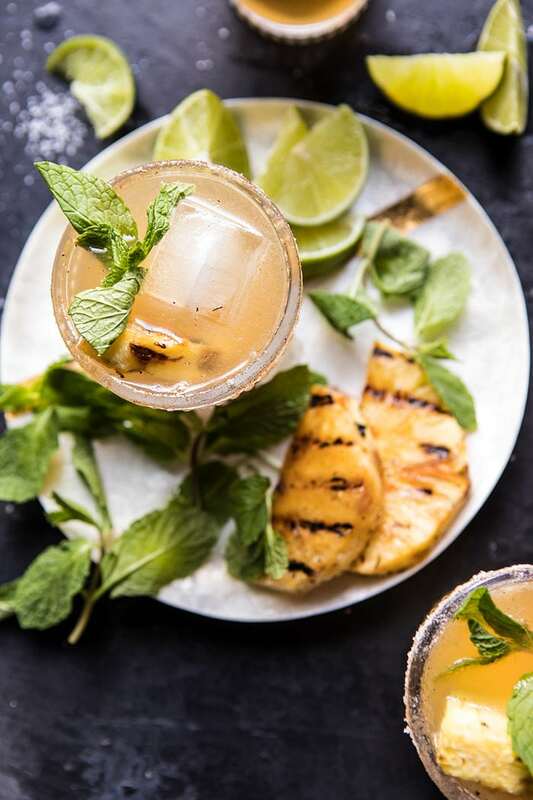 This pineapple margarita is not your average margarita. Because it’s New Year’s Eve, I really wanted an extra sparkly drink. I know champagne is the go-to for New Year’s Eve celebrations, but, if I’m being honest, I much prefer a fruity margarita topped off with some seltzer (as you can tell, I love carbonation). 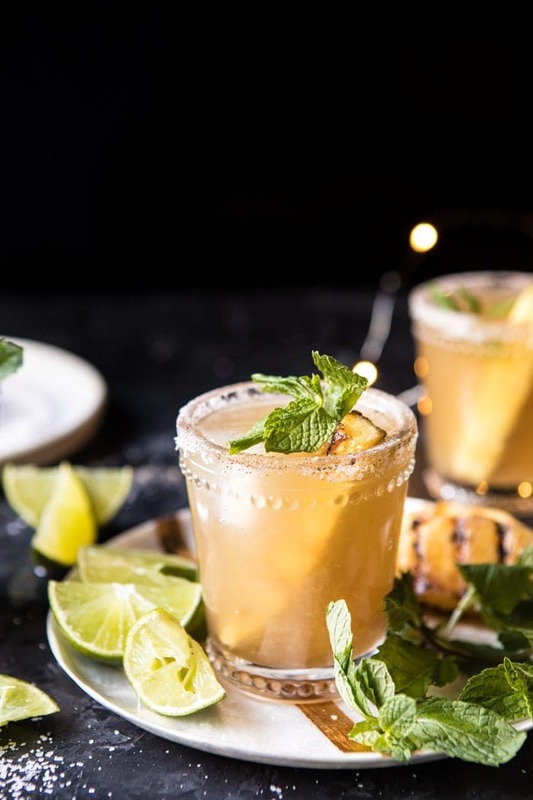 Enter this pineapple margarita sparkler, it’s pineapplely, filled with fresh juiced citrus, tequila, and then? Here’s how this pitcher style margarita works. Muddle a generous amount of fresh pineapple with both lime and lemon juice, strain, add tequila and a good splash Grand Marnier (my favorite cocktail mixer of the moment), and chill. 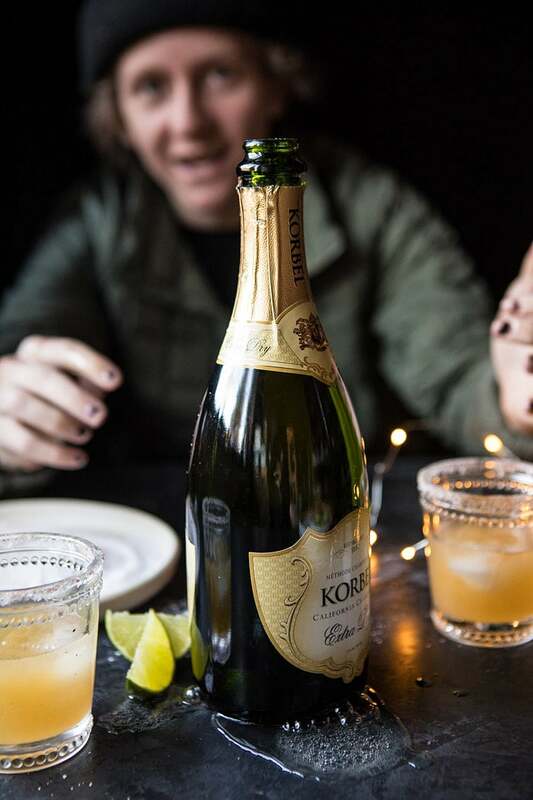 Then add champagne, and serve up in chipotle chili salt rimmed glasses, so fun! Drink up, and cheers to 2018! 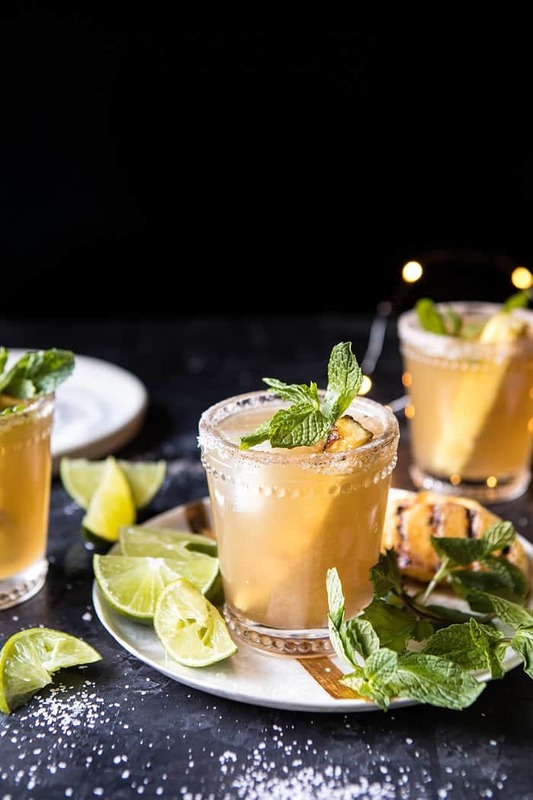 Muddle a generous amount of fresh pineapple with both lime and lemon juice, strain, add tequila and a good splash Grand Marnier. Chill. Add champagne. 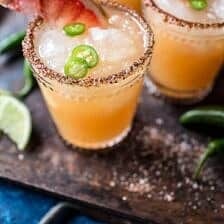 Serve in chipotle chili salt rimmed glasses. 1. In a blender, combine the pineapple, lime juice, and lemon juice and pulse to combine. Strain into a pitcher. Add the tequila and Grand Marnier. Chill until ready to serve. 2. Just before serving, add the champagne. Rim glasses with chili salt and divide the margaritas among glasses. 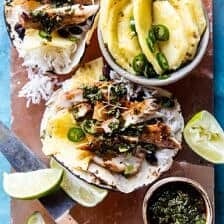 Top with fresh or grilled pineapple slices and mint. Enjoy! 1. On a shallow plate, combine the salt and chili powder. Run a lime wedge around each glass and then rim the glasses in salt. PS. the chipotle chili salted rim? It’s a must. Happy New Year Tieghan! 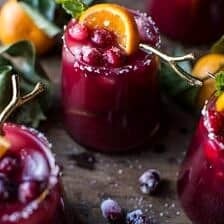 These cocktails look so deee-lish. And yeah… I could see how that chipotle rim is a must! Hope you have a wonderful year!! I hope you do as well, Ruth! Thank you! Wishing you a happy and healthy New Year! Just got your book and it is my favorite of all the cookbooks out there. Beautiful pictures and recipes that I can’t wait to make. Love your site. Awh thank you Rita! I hope you enjoy many recipes out of it! Happy New Year! Would canned pineapple work well here? So excited to try! These sound amazing. They serve a similar drink at Mas Tacos Por Favor in Nashville but it seemed a little watered down. I’m going to have to try these at home. I love the little hob nail glasses you are using. Where are they from? These look awesome. I had a pineapple margarita in Nashville once and it was a little watered down but these look great and I will have to try them. I want to know where those cute little hobnail glasses are from though. Absolutely fabulous. Lemon add was very inventive, brilliant! Hope you know that every holiday I turn to your recipes. Happy new year! That is amazing! Thank you and Happy New Year!! Well, I prefer this as my mode of eating more fruit. Lol! What a festive cocktail and so HAPPY. it’s never too late for a cocktail like these, even after the new year, very refreshing and delicious creative too, thank you! Chipotle chili rimmed glass is nice too! Thank you Sabrina! So glad you enjoyed this! So stunning, I love these sparklers!